The last time SPAL faced Milan in Serie A, Milan won the Scudetto and SPAL were relegated. That was 49 years ago, and so very much has changed since then. However the newly promoted SPAL certainly hopes to change their fortunes this year, having played in Lega Pro just two years ago. And even if the cards are stacked against them, they are a club with a long history who are looking to write more history this season. So we meet again. Can they wreak more midweek mayhem? Società Polisportiva Ars et Labor were founded 1907. But lets just call them SPAL. They have spent 22 of their seasons in Serie A, the rest in the lower divisions. Having been through bankruptcy a couple of times, most recently, they made the jump from Lega Pro to Serie B to Serie A in just two seasons, so cannot be written off. Their form thus far is D-W-L-L, with their most recent loss being to Cagliari on Sunday. For that match, Semplici lined up Gomis; Vicari, Vaisanen, Slamon, Mora, Schiattarella, Viviani, Filippo Costa, Lazzari, Borriello, and Paloschi. And yes, those are the Borriello and Paloschi you think they are. Semplici looks to be missing young goalkeeper Meret and forward Floccari to injury, with Rizzo and Della Giovanna also likely to miss for fitness. 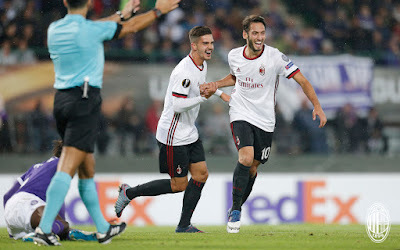 Montella, meanwhile, already has one big injury and a total of 11 new players to take to a top four win in the league, as well as competing in Europa League and the Coppa Italia come January. No pressure. With rotations that look more like speed dating and changing tactics along the way, it’s hard to see whether or not the team is actually gelling, even if results are positive thus far. While Conti will be out now for six months having had successful ACL surgery, Antonelli is still in doubt for this match. Then it becomes a question of squad rotation as to whom Montella will call up midweek. It would be easy to write off the newly promoted side and rest on our nine points and current fifth place spot in the league to predict a win here. But with Milan’s history of the past five years, change in ownership, then bringing in 11 new players, it’s like walking on loose rocks – it can be easy to lose your footing. So Milan will need focus, a strong mentality, and a continued improvement in play to take all three points from this match. It is always good to see historic teams rise to play in Serie A again, and facing a couple of exes makes it that much more exciting. So we meet again, SPAL.